I baked this a few days ago after realizing that the Munchkin is a bit particular as to how ripe of a banana he will eat, resulting in us having a bunch of spotty bananas on our kitchen counter. The banana bread is all gone now, with the majority of it eaten within the hours of it coming out the oven. I felt the need to blog about my banana bread solely because I get into these food phases where I become completely obsessed with consuming a certain food. I kid you not. You can ask my past roommates. Once, I was sooo food obsessed with chili that I ate it for 2 months straight. I ate it for lunch, dinner, and sometimes as a snack. Before that, I was on a nachos binge. I ate plates of nachos for a whole month! So, I thought by blogging about my banana bread that maybe I can break the cycle. The last thing I need is to be obsessed with eating banana bread! I used this recipe from the Williams Sonoma website, but really I have yet to encounter a banana bread recipe that didn't come out yummy. I've always made mine with straight up butter and so I was curious as to how it would taste with the addition of buttermilk that the Williams Sonoma recipe calls for. My verdict: pure yumminess! 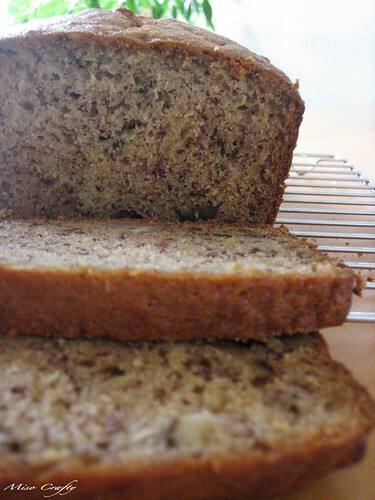 I'll definitely be using this recipe again when the need/urge to bake banana bread strikes. Cut the sugar back, around 3/4 cup is plenty, and cut the marg by half to a 1/2 cup. We also sub in flax for an egg substitute to make them vegan, but they'd likely be nicer with the egg. You can't really taste the coffee but it just makes them extra tasty! Ooohhh...thanks Wendy!!! And thanks for the tips! That sounds great! Now to wait for some bananas to get overly ripe again...I used the last of the bananas to make some smoothies! Can't wait to try out this recipe! Yum. My favorite! You should bake them in mini cupcake trays if you have them- perfect bite size! Go ahead and make the bread. You can always slice and freeze it, then at least you have to wait for thawing to eat it. Good idea!! I also have these mini bread pans too that I think I should definitely try out. I think I just might have to make 2 batches - some mini loaves AND bite-sized cupcakes! I'm sure the Munchkin would love the mini cupcake version! You read my mind! But we'll see if they even last long enough to make it to the freezer!